Ann Channin smokes joints to relieve the pressure of glaucoma and ease back pain. Photo by Robyn Twomey/RobinTwomey.com. 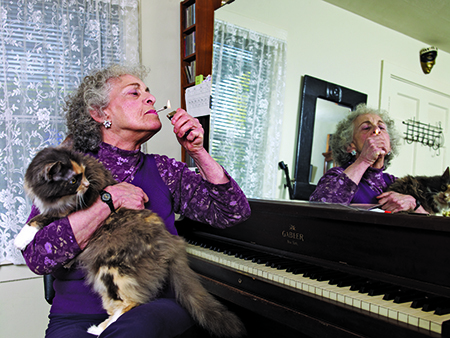 Ann Channin, of Oakland, Calif., has been smoking joints since medical marijuana became legal in her state in 1996. The 79-year-old jazz vocalist and voice teacher, who now resides in a senior retirement home, says it helps reduce the pressure on her eyes from glaucoma and eases the pain from a “messed up spine,” the result of scoliosis, stenosis and herniated disks. “If I can stop and take a few puffs several times a day, then my pain is relieved to some extent. It also makes me feel more energetic. When Jan Wasserman, an active 72-year-old former television producer who lives in both Mendocino, Calif., and at the Rossmoor retirement community in Walnut Creek, Calif., discovered she had lupus, she was devastated. Wasserman already suffered from Sjögren’s syndrome, an immune disorder. Several of her friends were successfully using medical marijuana—for insomnia and rheumatoid arthritis, for a nasty case of eczema and for an immune disorder—and at their urging, she asked her doctor if cannabis might control her symptoms. “Give it a try,” he told her, and the results exceeded her expectations. One of the loudest Jewish pro-legalization voices belongs to Jane Marcus, 68, whose passion comes from witnessing the benefits of marijuana firsthand. “A beloved friend from my synagogue contracted HIV from a blood transfusion. She was down to 85 pounds and had no desire for food,” recalls Marcus, a former New Yorker who now lives in Mendocino. “Marijuana brought back her appetite and extended her life for three years. That’s when I started asking myself, why is this illegal?” When Marcus joined the national board of Women of Reform Judaism, she successfully lobbied for a resolution in support of medical marijuana. In 2003, with her support, a similar resolution was adopted by the entire Union for Reform Judaism. Lee’s personal experience with medical marijuana began several years ago, after she had been prescribed opioids following two major operations. “I was totally out of it, sleeping all the time,” she recalls. “With my doctor’s permission, I tried medical marijuana and pretty quickly I was able to get off all those awful, addictive drugs.” Doctors are not allowed to prescribe cannabis but they can give patients recommendations that comply with state law, allowing them to either buy from a dispensary or supplier or grow it themselves. For his part, Nicholas Vita, CEO of Columbia Care, a company that owns dispensaries in five states, acknowledges that education about dosage and drug interactions is an industry problem, which is why his company plans to have licensed pharmacists at all its sites by the end of 2017. Awesome article! But you left out some major benefits of Cannabis. It has been used effectively in scientifically controlled studies as an anti-inflammatory agent, anti-bacterial, an effective pain medication, a tool to ease dependence on options for pain relief, and as a treatment for PTSD, paranoia, anxiety, both positive and negative symptoms of schizophrenia, and probably many other ailments. Nice article! everything is elaborated nicely. Many doctors prescribed Cannabis for pain, Crohn’s disease and a variety of other conditions. Besides the lack of long-term health troubles, frequent marijuana dose can sometimes be an effective form of self-medication. It’s always great to hear that people of all ages and backgrounds find relief for multiple conditions just from marijuana. Thanks for sharing! Firstly the best article. Herein I have founded the great information, not only 28 states it is legal but also it is need to legal all over the world for publicity our marijuana. I have enjoyed the whole topics. Thank you so much. This article leads to a great outlook for this medical marijuana, thank you. Indeed, thorough studies and law regulation can successfully bring this effective solution to as many. Good luck. That’s true. Medical marijuana not only eases the pain of the treatment of cancer but also helps in stopping its growth. truly a wonder herb it is. I think I’m a millennial cannabis consumer. Great info about cannabis and demographics! I learned so much about this post. Thanks for giving me a new perspective!